Lennar Starts Off 2019 With an Earnings Beat. Can It Keep It Up? 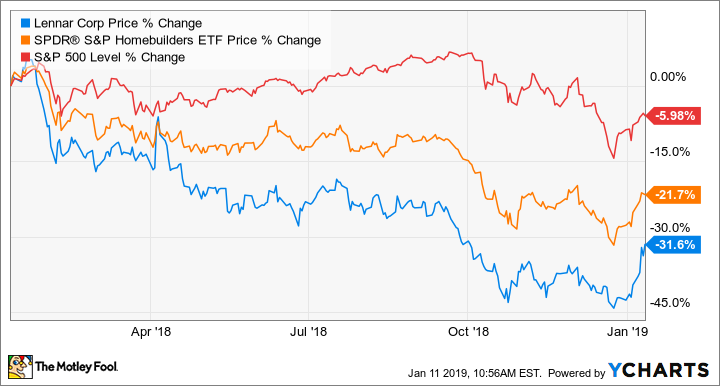 The nation's largest homebuilder by market capitalization was able to blow past analyst expectations, but there are still signs that headwinds are developing. Check out the latest Lennar earnings call transcript. You wouldn't know it from Lennar's (NYSE:LEN) (NYSE:LEN-B) stock performance in 2018, but the company beat earnings a couple of times last year thanks to strong booking numbers and acquisitions. It was able to continue that momentum into 2019 with a fourth-quarter earnings report that was way beyond analyst expectations. What's more, it even announced a share repurchase program. All of these things should point to an incredible year, but some of Lennar's quarterly numbers don't paint such a rosy picture. Let's sift through the most recent earnings report to see what's working for and against the company. DATA SOURCE: LENNAR EARNINGS RELEASE. EPS = EARNINGS PER SHARE. Lennar's results for the most recent quarter don't show any real hints of a slowing housing market. Compared to the prior year, home deliveries were up 64%, revenue was up 71%, backlog increased 85% to $6.6 billion, and management was able to use its scale to reduce overhead expenses. For the fourth quarter, sales, general, and administrative costs as a percentage of revenue fell to an all-time low, to 7.9%. There are a couple of things to keep in mind. For one, the company netted a one-time gain of $296 million for its Rialto investment and asset management business. Also, the company has closed two acquisitions since the beginning of 2018 that make these year-over-year numbers look better. Management noted that the market was noticeably softer this past quarter and that high housing prices and rising mortgage rates were having an impact. The two yellow flags in these results was that net new orders (10,611) were considerably lower than total homes delivered (14,154) and the average selling price for new orders was 5.7% less than delivery prices. This is the second consecutive quarter where both of these metrics slipped. This may not be a huge deal as this is a seasonal business and new order numbers are typically weaker in the third and fourth quarters of the year. That said, a book-to-bill ratio of 0.75 is low enough that investors should pay attention. Lennar is primarily known as a homebuilder, but it also had some ancillary businesses like Rialto. This quarter, though, Chairman Stuart Miller noted that the company was getting back to its roots. [W]e advanced our strategy of reverting to our pure-play core homebuilding platform. We completed the sale of our Rialto investment and asset management platform for $340 million. Additionally, in the fourth quarter, we contracted to sell our Berkshire Hathaway real estate brokerage business and the majority of our retail title business along with our title insurance underwriter. Both of these transactions closed in the first quarter of 2019. From an investor's perspective, these other businesses didn't really move the needle and they were likely more a distraction than a value driver for management, so it's encouraging to see this. As far as the housing market is concerned, Stuart echoed his comments from the prior quarter about how he and the rest of his team think that this recent slowdown is a short-term issue related to pricing and that there are still large factors working in its favor. It's a bridge too far to say that Lennar investors should be concerned with the recent slowdown in sales. The housing market over the past several months has been hitting incredible highs that are difficult to maintain over the long term. The company still has an opportunity to do well from here, but perhaps not as well as we have seen recently. If new orders continue to fall short of deliveries, it will eventually lead to declining sales. For now, though, the company can lean on its scale and immense backlog to maintain a decent level of profitability for some time, and management is now electing to dedicate more of its cash toward reducing debt and buying back shares instead of developing more land and housing lots. The day after earnings it announced a $1 billion share repurchase program. With Lennar's stock trading at 11 times earnings, it certainly looks cheap and buying back stock isn't a bad idea. That said, if we were to start to see sales numbers slip along with new order numbers, then it may be better for management to sit on the cash and wait to buy back stock further down the road.